In southern Chile a dramatic sixty-day hunger strike that left four young Mapuche prisoners near death ended in celebration. 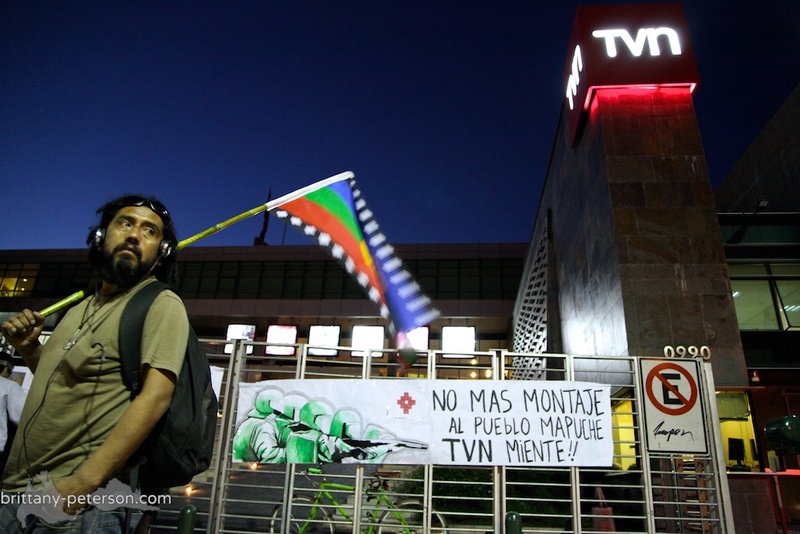 A man with a Mapuche flag stands outside a major Chilean TV station at a protest on October 24, 2012, against a special report aired the previous day. The report focused on the Mapuche-Chilean conflict, but the protesters contend it did not provide historical context or mention the prisoners then on hunger strike for nearly sixty days. Your family’s land was seized before you were born, and the new owner, a forestry company, isn’t going to return it because it is more powerful than you. Your community holds peaceful demonstrations to recover the land because bureaucratic processes have proved unsuccessful. Police raid your community at night. You get angry and go to confront police officers when they show up to guard the company’s equipment one morning. You are arrested and convicted for attempting to murder a police officer because you shot a pistol at his helicopter. You know his testimony has no basis—how could you have intended to kill a person by shooting at an armored helicopter?—but it doesn’t seem to matter. You are given over ten years in prison. The truth is almost never acknowledged in these kinds of cases, because like all those convicted before you, your political power is nothing compared to that of the company, and the government. In southern Chile a dramatic sixty-day hunger strike that left four young Mapuche prisoners near death ended in celebration last week. The four prisoners belong to the Wente Winkul Mapu indigenous community over 350 miles south of Santiago, where Mapuche (meaning “people of the land”) have been mobilized for years in a struggle against private estate owners and multinational corporations to recover their ancestral territory, much of which was seized in the nineteenth and twentieth centuries by the Chilean state. Despite the deep, historical roots of this struggle known to indigenous tribes all over the world, constructive efforts at resolution in Chile are non-existent. The country’s economic stability and strong climate for foreign investment has come at a high cost for the indigenous populations, leaving natives with little land and the tough decision to migrate or face rural poverty. The lack of political will for a solution that can rectify previous land seizures has inspired radical mobilization efforts by young Mapuche as they fight to reclaim their ancestral land. Without much government reform, the conflict unfolds on a daily basis between tribe members and police officers as they break up land occupations and raid rural communities as methods of “preventative warfare”—a national security doctrine established under former Chilean dictator Pinochet and since carried out under democratic administrations. During these raids, officers often search for unauthorized weapons in Mapuche homes on the suspicion that resistance groups and communities are arming themselves for guerilla warfare, based on anonymous arson attacks on private properties in the area. Critics argue these raids are used to intimidate the communities from mobilizing. The four young men ended their hunger strike on October 25, after a Supreme Court ruling annulled the trial that convicted two of the four men of attempted homicide against a police officer last November. The trial was annulled based on the prosecution’s failure to present sufficient evidence for their conviction. The two other young men, one who was brutally beaten and later hospitalized during the raid that led to his detention, await their trial. Scores of Mapuche have been prosecuted under an anti-terrorist law, created in 1984 under the Pinochet dictatorship to convict and imprison Mapuche activists. Although Levinao and Levipán were not prosecuted under the anti-terrorism law, the excessive application of the statute to Mapuche activists was a subject of the hunger strikers’ demands. Currently, there are about forty Mapuche community members imprisoned or awaiting trial under this law. In addition to giving harsher punishments to people accused of terrorism for what would be a lighter punishment under civil law, the anti-terrorism law permits anonymous testimony for use in trials, which stack the odds against the Mapuche in the courtroom. However, the Chilean state will face prosecution next year in the Inter-American Human Rights Court in Costa Rica for “violations committed between 2001 and 2003 regarding convictions under the antiterrorism law of members of the Mapuche community,” according to Jimena Reyes, head of the Americas Desk of the Inter-American Federation of Human Rights. The unanimous Supreme Court decision that ended the hunger strike granted a retrial to Daniel Levinao, 20, while Paulin Levipán, 22, was given a reduced conviction from ten to three years for assault of a police officer. However, the court upheld the conviction for illegal possession of arms, for which both men must complete a 541-day conviction. Luis Melinao, a spokesperson for the hunger strikers and the Wente Winkul Mapu community, said his community and the prisoners’ family members were pleased with the court’s decision. “It ended up how we wanted it to, which was to annul the trial for Daniel [Levinao] and lower the penalty for Paulino [Levipán],” said Melinao. Although the hunger strike included additional demands such as the complete return of land to the Mapuche people and the removal of police forces from their rural communities, the annulment of their trial was a major advance for the defense of human rights and a testament to a functioning judicial appeals process in Chile. However, the union conglomerate of the Araucanía region (to which many estate owners—often the main actors in challenging Mapuche land reparation efforts—belong) criticized the court’s ruling in favor of Levinao and Levipán. “We believe these decisions create indifference in citizens and support delinquents who continue to act with utmost impunity,” said union spokesperson Emilio Taladríz, who found pamphlets of the Mapuche cause scattered on his property after an arson attack last July. Although the retrial date has not been announced, the defendants’ lawyer Lorenzo Morales discussed plans to lower the penalty even further. “There was implausible evidence, that is what we have to leave clear,” he said. This is the third major Mapuche prisoner hunger strike in three years, along with multiple shorter hunger strikes by non-Mapuche students in the last two years. 2010 and 2011 each saw a Mapuche hunger strike that lasted over eighty days. Both included demands similar to those of the strike at hand, such as an end to unjust detention of political prisoners, the total return of ancestral land and an end to trials carried out under a tough anti-terrorism law, which hands out harsher convictions for crimes that would have otherwise been processed under civil law. After fifty-one days of the hunger strike, President Piñera emphasized that the government would maintain the state of law. “If a judicial power condemns someone, the ruling should be fulfilled,” he said in an interview to Radio Esperanza in Temuco. “On the contrary, if the 55,000 imprisoned Chileans could have a hunger strike to be freed, that would be the end of the state of law, and would worsen security in the region,” said Piñera, as he explained why the government would not succumb to the strikers’ pressure. However, maintaining peace and security based on written law is not the only role of a sound state. The review of state decisions through an appeals process is another key factor, which was the basis for the human rights case made for Levinao and Levipán, leading to the Supreme Court’s review. Chile, in addition to defending its laws, is responsible for defending human rights. When a local Court of Appeals in Temuco granted police officials permission to force-feed the prisoners, the commitment to that responsibility was rightly questioned. “If they want to force feed us we will sew our mouths shut if necessary,” the prisoners wrote in a statement. The Supreme Court decision arrived at the heat of this debate and prisoners were never actually force fed, despite the Temuco Court of Appeals’ approval to do so. “In the end, I believe it is the only tool you have, using your body, to protest and create a space for political agreements…and a fair trial,” said Mapuche historian Fernando Pairicán in an interview on Demasiado Tarde, a popular pop-culture show among young people. In the same interview, Pairicán gives an example of three ways the Chilean government blatantly contradicts itself on indigenous rights. First, the government awarded the 2012 National History Prize to Jorge Pinto, who wrote extensively on the “historic debt” to the Mapuche in Chile, which Pinto says failed as a state in regards to indigenous issues. Second, the Interior Minister Rodrigo Hinzpeter is implementing extensive and violent police raids in rural Mapuche communities, forcing an ethno-historical issue to play out between police and tribe members. Finally, Treasury Minister Joaquín Lavín has been talking about the need to “Mapuchize” the Chilean people and grant autonomy to a Mapuche nation. This third concept of “Mapuchization”—that Chileans need to be more like the Mapuche—is perhaps a symbolic, but nonetheless extremely progressive comment from a conservative government in a country where neoliberalism, frequent Catholic holidays and soccer are favored above all other issues. “Three perspectives on the same issue. What does that tell you? Contradiction within the government, or that they simply do not know how to resolve this issue. It is not a conflict, it is the question of [creating] the Mapuche nation,” said Pairicán. While the government continues its confusion on how to resolve land reparations and its silence on the issue of recognizing a Mapuche nation, rural protests and academic work increasingly contribute to the national discourse, and are pushing for real solutions. As Pairicán pointed out during a TV interview, two major books on Mapuche issues have been published this year, and discussion of the topic has increased significantly. From packed book launches to the punctuation of government silence on the young Mapuche men’s annulled trial, the issue of finding comprehensive solutions to the reality faced in Mapuche communities today is steadily making its way to the forefront of the political debate.